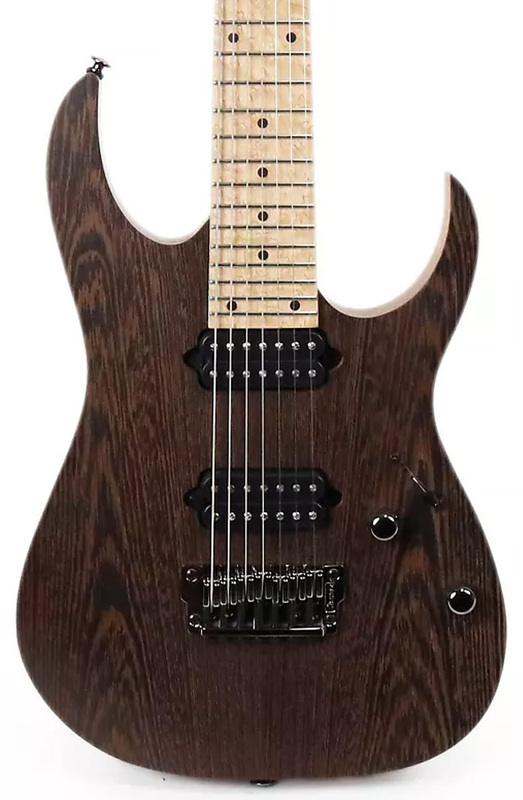 The term Super Strat has been used loosely to describe a whole array of electric guitars with a double–cutaway, Fender Stratocaster–style body, smokin’ hot humbuckers, and a locking tremolo system. The trend was kicked off by Eddie Van Halen with his homebrew Frankenstrat, which inspired a rich tradition of amateur–built Super Strats. The Super Strat craze was born thanks in large part to these amateurs modding lackluster guitars built by the big manufacturers. In the late 1970s and early 1980s, Fender and Gibson were growing out of touch with their market largely due to corporate mismanagement. CBS, for instance, was tainting Fender's established legacy as a high–quality brand by prioritizing cost cuts over consumer demands. Unstable 3–bolt necks were introduced and players were not happy. Likewise, Gibson (owned by the Norlin company) was cutting costs by building inferior guitars with heavy, multi–piece bodies. The Norlin era’s ugly designs didn’t help the company’s case (check out the Corvus). 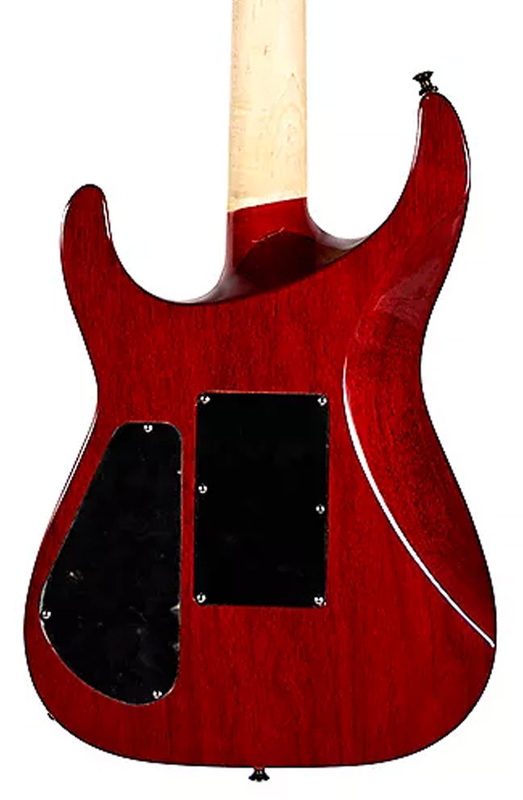 During the this time, companies such as Schecter, Warmoth, and Mighty Mite were offering replacement bodies for sale by mail order. Until then, only professional luthiers had easy access to replacement parts. These companies gave the lay shredder and home tinkerer the ability build a guitar for the first time. This is how Eddie Van Halen became the prototypical amateur guitar modifier. Of course, there is a massive amount of diversity amongst those manufacturers as part of a Super Strat arms race in the ‘80s, but some common tropes did emerge. Literally going part by part to trace which builders were responsible for which innovations unfolds a fascinating tale about one of the few guitars that was not designed by one company and copied over and over — like the Les Paul, for example — but was truly designed by an entire industry. Many guitar players were embracing heavy woods and hardware in a bid for better tone. Heavy body woods offered by amateur–focused companies like Warmouth and Schechter included padauk, zebrawood, and wenge, as well as heavier variants of the more commonly used maple and ash. The advent of higher–gain amps, preamps, rack effects, and new pedal designs needed a more focused and direct guitar sound, and the heavier wood guitars helped create a more uniform tone. On the other end of the spectrum, some mod–obsessed players wanted to go as light as possible and turned to poplar and basswood — two woods that are now commonly used in guitar manufacturing. The neck joint on the original generation of Super Strats was almost exclusively a classic 4–bolt neck plate design. This was more stable than the 3–bolt design Fender was using in the late ‘70s and ‘80s, which led to the necks shifting and causing playability problems. In fact, many players at the time converted their 3–bolt Fender to a 4–bolt for better stability. Yet two of the most important neck innovations at this time were the advent of the thinner neck and the widespread adoption of neck–through construction. With the rise of fast metal playing and guitar virtuosity by the likes of Eddie Van Halen and Steve Vai, players at the time were seeking better and better playability. That’s when necks began to become thinner and wider, with Ibanez, Kramer, and Jackson leading the pack. 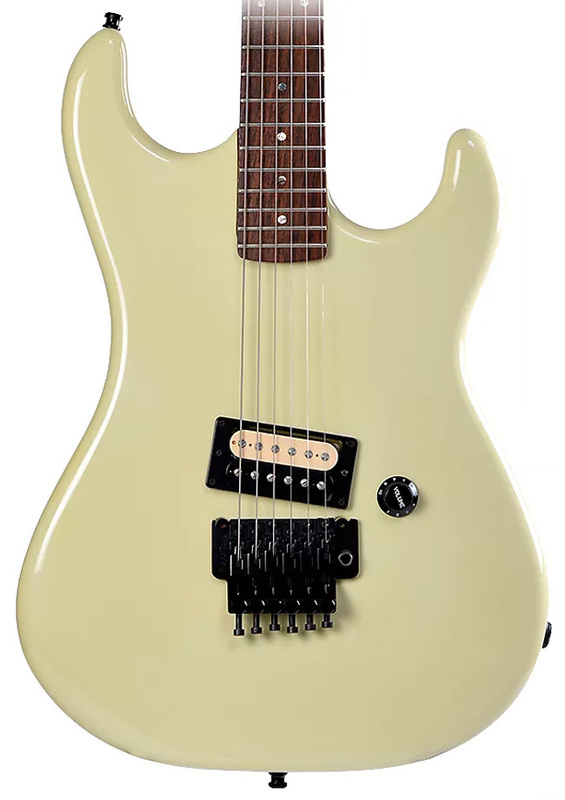 Ibanez also pioneered neck–through guitars for the masses with its Alembic–inspired musician models, and Grover Jackson made this a Super Strat innovation in its own right. When working with Charvel, luthier Grover Jackson tweaked the Super Strat template through one–off custom guitars he built as side projects. 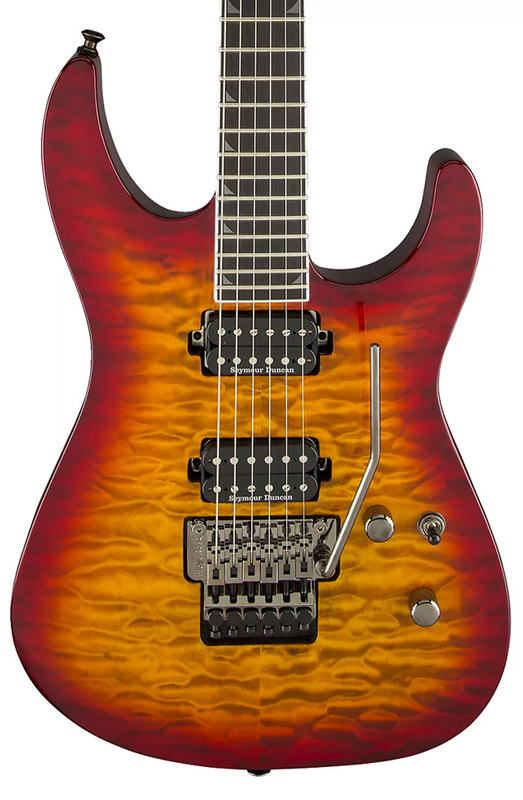 Those neck–through projects would be refined into the Soloist, which Jackson would use to launch his eponymous guitar brand. 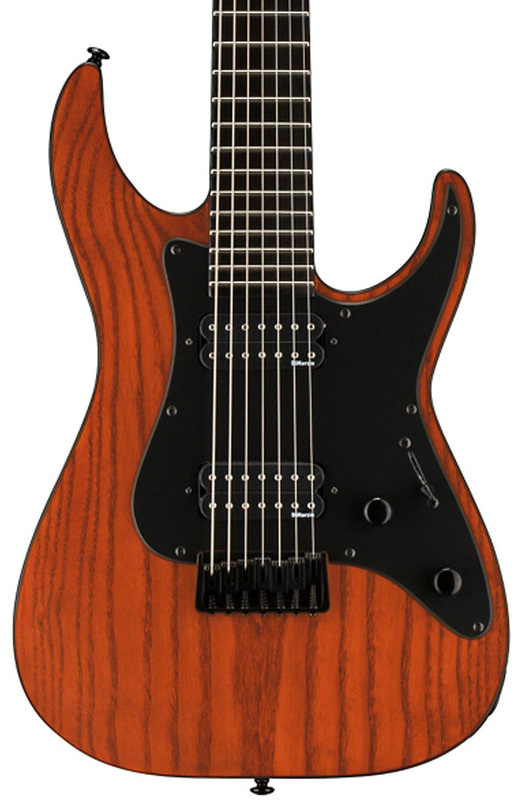 Neck–through construction allowed for a more responsive guitar with much greater sustain. This method of construction also allowed for a greatly reduced heel, making access to the higher frets effortless. 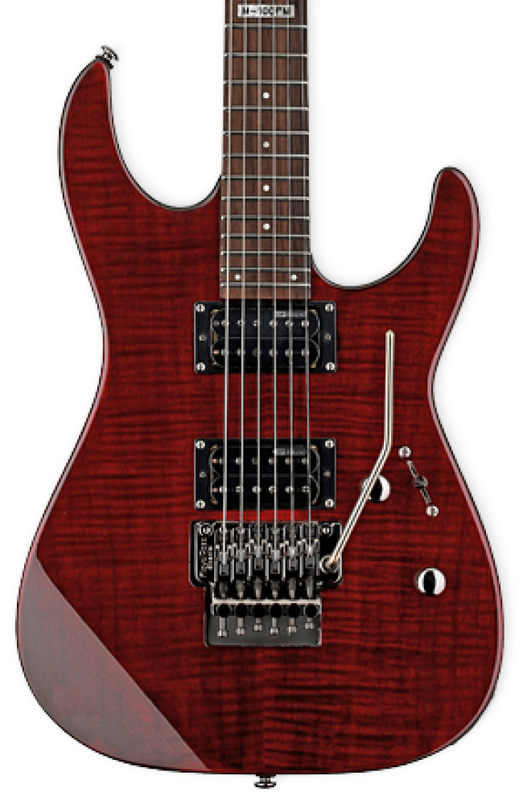 Shredders were no longer impeded by a bulky heel of a traditional bolt–on or set neck guitar. Without a doubt, the iconic bridge of the Super Strat is the Floyd Rose locking tremolo system. While many have tried their hands at the double locking tremolo design game, only Floyd has become an industry standard. Others have had limited or no success, such as the Kahler, Washburn Wonderbar, Kramer Rockinger, and various less precise variations. None have achieved the reliability of the Floyd. Designing in 1977, Floyd Rose found that tuning stability was only achieved when the string was locked at the neck and at the bridge. With this double–locking system, the string would no longer slip at the nut or the saddle of the bridge. This double–locking innovation not only contributed much needed tuning stability to a tremolo system, but also allowed for wild pitch–shifting down and up. The range of that pitch shifting was more dynamic than ever, especially when pulling the bar to pitch the notes up. The Floyd Rose system became a tool that every burgeoning guitar player needed to master. Floyd also pioneered the use of fine tuners at the bridge to really keep the guitar in playable and precise tuning. 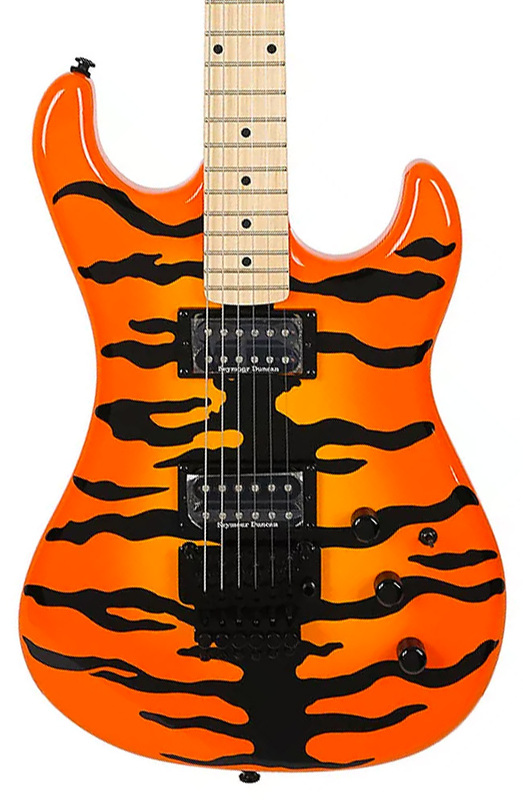 Kramer was the first manufacturer to adopt the Floyd Rose system, ditching the Rockinger system that was originally favored by Van Halen for his signature model. Van Halen and Rose worked together on many of the system’s refinements, and it has remained relatively unchanged and unchallenged since getting just about nailed in the mid–1980s. Modders in the 1970s and 1980s were experimenting with heavy materials to induce more sustain. In the rare occasion that a Super Strat did not have a locking nut, brass was the ideal nut material. Ibanez became the first manufacturer to popularize the brass nut, even though Gretsch had used the material on and off in the 1950s and Alembic started using it for smaller–scale builds in the 1970s. Jazz players such as George Benson (also an Ibanez endorser) used combination bone and brass nuts to get the best of both worlds. Many players found brass's long sustain worthwhile despite the inconvenience of strings breaking more often at the nut. Pickups are the biggest tonal driver in the Super Strat. With the boom of companies building replacement pickups in the 1970s and 1980s — including Dimarzio, Seymour Duncan, and Schecter — the home modder had more options than ever for cultivating a signature sound. For the Super Strat, higher output humbuckers were preferred, since they made overdriving an amp a whole lot easier. Ceramic magnets were used over alnico since they created higher output, lending pickups a more powerful and focused sound. 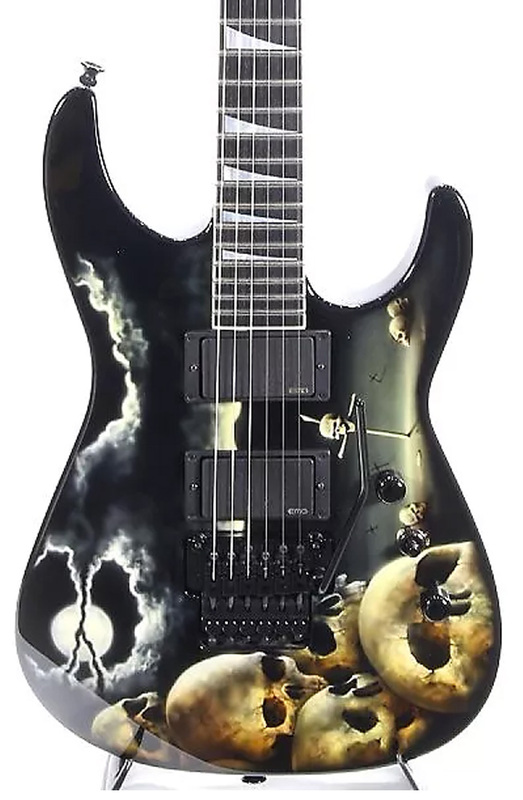 Popular ceramic models included the Seymour Duncan JB, Dimarzio Super Distortion, and the EMG 81. Ceramic magnets can be harsh, but that harshness can be tamed through some creative design. A pickup’s positioning, for instance, is one of the most interesting influencers on tone. 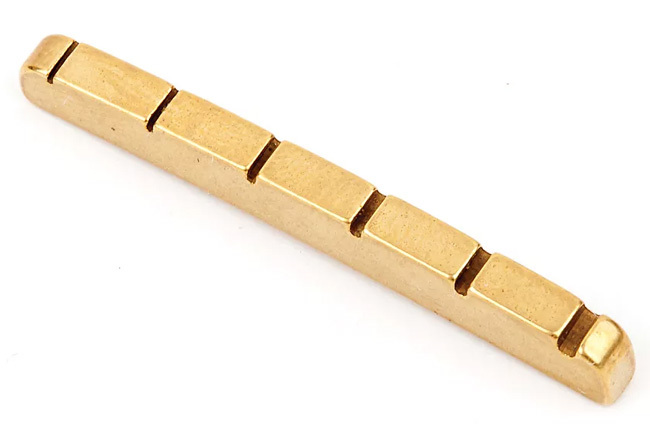 Many Super Strat manufacturers angled their bridge humbucker — like Kramer with its Baretta — to better align the pole pieces with the string spacing of the Floyd trem. This shifting emphasizes more bass and higher treble while limiting the flubby and harsh bass tones that bridge humbuckers on Strat–style guitars can sometimes have. 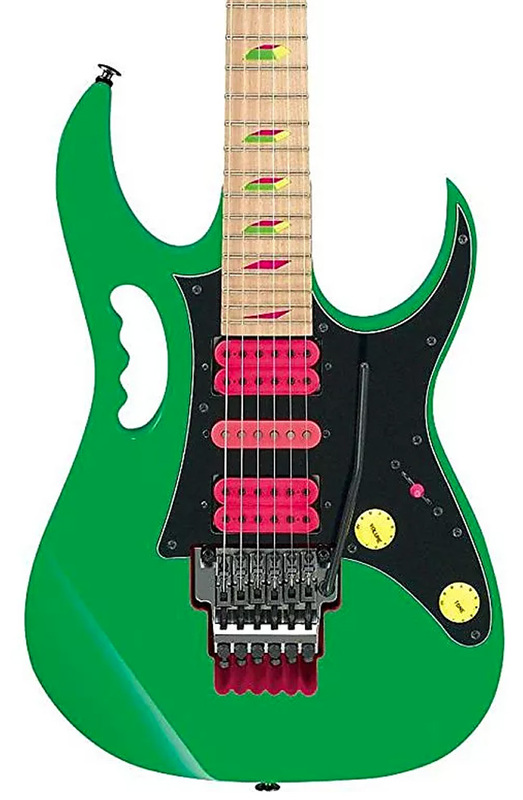 You can’t talk about the Super Strat without talking about the wild finishes and graphic art so many of these models exhibited. Starting with Van Halen’s Frankestrat, Super Strat players prided themselves on the individuality of their guitars. Ibanez, Charvel, Hamer, and the many Japanese imports of the time (Aria, Westone, etc.) pioneered the unique solid colors, while Kramer and Jackson went over and above anything seen at the time. Kramer had tiger, leopard, and other animal print color schemes, while Jackson had amazing graphics, with the samurai, lava, piles of skulls, and scantily clad women being popular themes. This movement toward art being a fundamental part of the instrument pushed figured wood to the background of guitar aesthetics. An '80s Relic or a Timeless Instrument? When playing a classic Super Strat, it can sound harsh, heavy, and bright. However, these guitars come alive with heavy distortion. The concentrated bright tone allows for the guitar to cut through a high–gain amp. When played clean with delay, chorus, and reverb, the brightness keeps the guitar from getting bogged down by the low–end those effects tend to add. While the Super Strat is very much so a relic of the ‘80s, nothing is better for high–gain, high–speed, and deep–dive tremolo playing. Who made your favorite Super Strat? Ever made one for yourself? Let us know in the comments.